Xiaomi hasn't really kept a tight veil around the next installment of its flagship smartphone, it seems, as we've seen quite a few leaks lately, detailing both the phone's hip design, and impressive specs. So far we've seen photos of the phone's super-thin side bezels, though we haven't had a nice look of its slim profile. Well, thanks to another leak, published by Chinese tech blogging site IT Home, we can now feast our eyes on what is allegedly the Xiaomi Mi5's slender chassis. If you've missed the news – these unibody casings are meant to hold a 64-bit octa-core Snapdragon 810 CPU, with the Adreno 430 GPU, a 5.7" QHD (1440 x 2560) resolution screen, and a 20.7 MP Sony Exmor sensor for its main snapper, all priced at $325 off-contract. Anxious to see it? Well, latest rumors claim that it may make an appearance at 2015's CES in Las Vegas – that's next month. Looks like Xiaomi is slowly, but surely, moving towards that global push that's supposed to launch it to the top spot in the smartphone manufacturer ladder, as this is the first time that the company has chosen to unveil a new model at an event held in the USA. I don't care if companies tend to copy others if they implement it in better way. 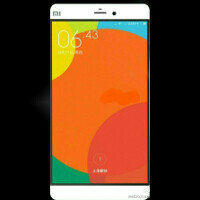 If the pictures above are for real, I am definitely buying the Mi5. It was a Mi4 concept made by a fan more than half a year ago. Google it. Xiaomi never failed to impress me. Bring that metal beast to more markets and kill the ugly iPhone to rest. concept-phones.com You can find it there. Good design but they steal data.